Great Smoky Mountains National Park has over 2,000 miles of running water, and its folded topography allows for rocky slopes at every elevation and almost literally around every corner. Water plus sloping rock equals waterfall – and the park has them in abundance. 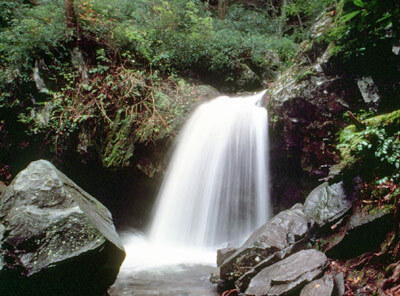 The majority of the popular waterfalls are on the Tennessee side of the park, and Gatlinburg makes an almost perfect center for visiting these falls. Most of the falls take a hike to get to – ranging in difficulty from strenuous through moderate to easy. There are two waterfalls, however, that you can see and approach easily from the roadside – a great help to the physically challenged or families with small children (and large cameras!). See our articles on Place of a Thousand Drips and also Meigs Falls. Here are some of the most visited, photographed and remembered waterfalls. Waterfalls in Great Smoky Mountains National Park. The trail begins in the back of Cades Cove loop road and is a moderate hike. This wide trail climbs two ridges and follows Abrams Creek to Abrams Falls, a 20-foot fall into a large pool perfect for swimming and wading. Abrams Falls has the largest water volume of any park fall, and is among the most photogenic. This trail is located off the Roaring Fork Motor Nature Trail, through a hemlock dominated forest. Grotto Falls crosses three small streams and is distinctive as the only waterfall in the park one can walk behind. Near Cosby Campground, south of Cosby, Tennessee. The main trail leads to the top of the falls and a steep, narrow side trail leads to the bottom. Although it does not carry a high volume of water, Hen Wallow is a beautiful cascade that fans out as it slides down sheer rock for almost 100 feet. Start the hike out of the Deep Creek Area. This flat trail leads to picturesque Indian Creek Falls, which cascades 60 feet down a series of ledges into a wide pool. The trail is located about one-fourth mile beyond the Deep Creek campground Amphitheater. The trail leads uphill through pine-oak forest to a lovely cascade. The easiest waterfall hike on the Tennessee side of the park, which follows a paved trail. The trail cuts through the middle of a series of cascades. Laurel Falls is 60 feet high. At 80 feet, this is the highest single plunge water takes in the park. This trail makes a good challenge and reveals a beautiful fall. The trail head begins in the Greenbrier Area. The trail passes through an old growth deciduous forest before reaching the 100 foot high Ramsay Cascades, the park’s highest waterfall. Hike out of the Smokemont Campground. A small, but graceful fall, this area makes a good moderate hike.